There are countless ways of looking at the transience of our lives. Based on religion, for example, in which there is traditionally plenty of faith in a hereafter. Or based on humanism, in which humankind is the point of departure and the meaning of our once-only life on earth takes centre stage. And based on art, whereby artists represent and reaect upon our human condition. In the Once in a Lifetime exhibition, eight artists shed light on various aspects of life and mortality. What traces do we leave behind? How do we deal with time, memories, the things that are lost? 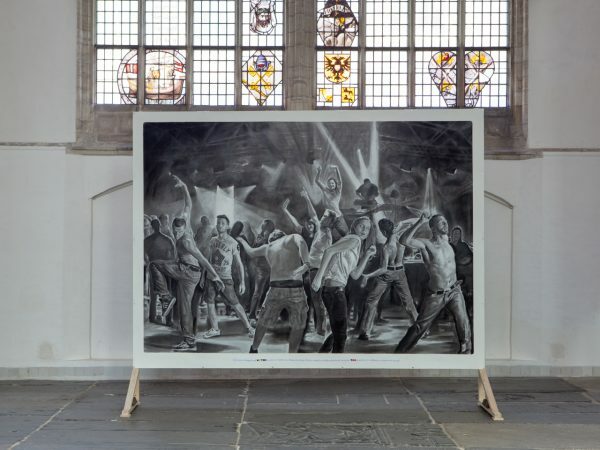 Four artists – Daniëlle van Ark, Amie Dicke, Job Koelewijn and Muntean/Rosenblum – created new work specially for the exhibition, seeking out meaningful places in the church to present their work. 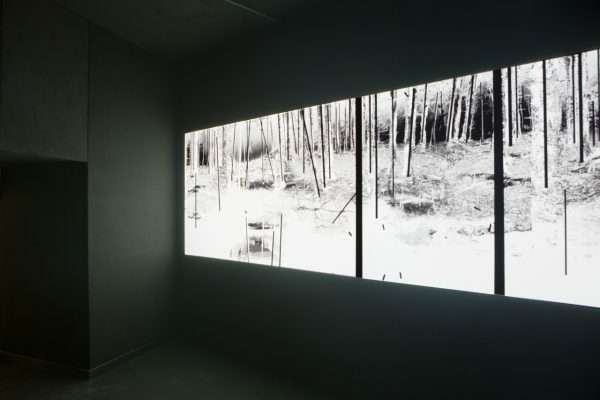 The curator Nina Folkersma also selected existing works by four other artists: Michaël Borremans, Stan Brakhage, Folkert de Jong and Yehudit Sasportas. These works of art offer diverse perspectives on the mystery of life and death. They urge you to be aware of what makes your life unique, fragile and inimitable, as formulated in the statement by the Belgian author David Van Reybrouck that serves as the exhibition’s motto. 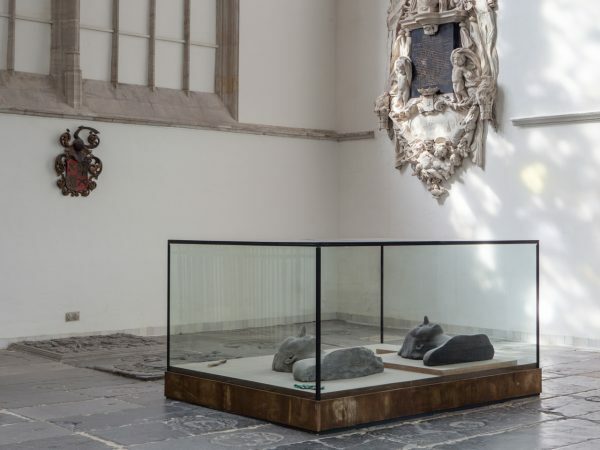 In the Kerkmeesterskamer (Church Warden’s Chamber), Daniëlle van Ark (NL,1974) has constructed an installation that sits midway between a domestic cupboard and a museum-like display case. This display case/cupboard, La mémoire collective, contains a collection of seemingly random found and made objects, including sawn-through ‘love padlocks’ from a Parisian bridge and glass negatives from the early twentieth century. They are objects that are symbols of commitment and love, but also for the desire (doomed to fail) to hang on to time and life. 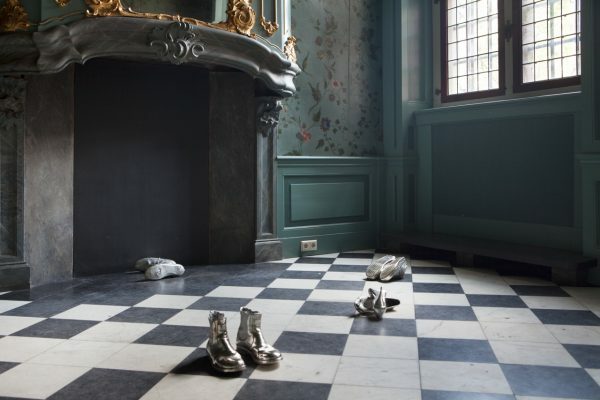 In the Spiegelkamer (Mirror Room), Van Ark has placed a dozen pairs of silver-plated shoes, evidently worn by dear friends of the artist. She is hereby referring to the first pair of baby shoes that people have had silver-plated as an emotional keepsake for later. Since her residency at the Rijksakademie van Beeldende Kunsten – the State Academy of Fine Arts – Daniëlle van Ark has been using a variety of media and materials in her work, giving old photos, cards or trophies a new lease of life. She appropriates objects and places them in a new setting and a different context. Social status and outward display are recurring themes, but Van Ark also shows the upside of these phenomena by emphasizing the fragility and transience of life. Two grey, matte-finished busts, covered by a fine layer of dust, recline backwards like two Medieval gravestones. The bronze sculptures look as heavy as lead, but their forms are soft and well-nigh fluid. They each have a duck’s beak instead of a nose. According to the artist Michaël Borremans (BE, 1963), the beaks make the work’s dramatic nature more intense. Borremans had already painted recumbent figures and beaks, but here he has for the first time employed these elements in a sculpture. As in his paintings, these figures are shrouded in a mysterious atmosphere, as if they are not entirely of this world. Over the last decade, Michaël Borremans has emerged as one of today’s most prestigious artists on the international stage. His paintings, as well as his drawings and films, are often populated by figures who with a certain equanimity do strange things or perform bizarre rituals. This results in ominous yet mysteriously seductive scenarios: frozen fragments from an indeterminable and intangible time, devoid of bright colours, in which nothing is what it seems. 16 mm lm, color, silent, 12 min 11 sec. In the film Window Water Baby Moving, Stan Brakhage (USA, 1933–2003) documents the birth of his first child. He filmed the first contractions, the moment of birth and the cutting of the umbilical cord with a 16mm camera. The film is not intended for the lily-livered; Brakhage shows everything, in jerkily edited, raw close-ups. He displays the start of life precisely as it is: a moment that is mixed with pain, blood, sweat and tears. But with great joy as well. It is all very intimate and moving, and the eventual result is an ode to life. Stan Brakhage is regarded as one of the most important figures in twentieth-century experimental film. Over the course of five decades he produced a large and diverse oeuvre in which he experimented with different formats, approaches and techniques (such as painting on and scratching the celluloid). In his films he explores life’s great themes: birth, sexuality and mortality. 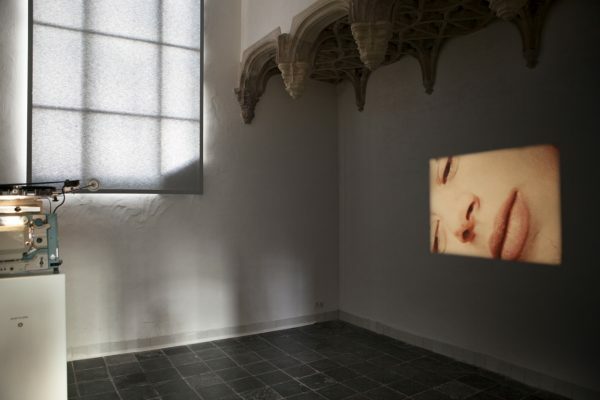 Amie Dicke (NL, 1978) is showing a collection of soaps in the Sint Sebastiaanskapel (St Sebastian Chapel). There they lie set in a long, neat row: desiccated, full of little cracks, slimmed down and shaped by the hands that have massaged them time and again. The soaps are the frozen memories of their user, but for Amie Dicke they are also a memento of that one bar of soap belonging to her grandmother, which she deeply regrets not keeping. Dicke’s method of working is based on the notion that events and memories stick to places and objects. Dicke searches for traces, souvenirs and ‘after-images’, as she calls them, and renders them visible with subtle interventions – or highlights the invisible connotations of what is present. You could say that the artist creates ‘works imbued with soul’. In order to imbue her works with this overtone, she spends many painstaking hours searching for historical layers that have left their traces behind. Coincidence – in the literal sense: what happens to you or crosses your path – often plays a role in this. *The realization of this artwork is made possible by the help of Hotel Sofitel Legend the Grand Amsterdam. In the work Heritage by Folkert de Jong (NL, 1972), and older man and child are sitting on a stack of pallets. Downcast and timid they stare straight ahead. In the monumental church they seem particularly vulnerable and lonely. Where do they come from? What are they waiting for? What is making them so dejected? By calling the work Heritage, Folkert de Jong is alluding to the fact that we are not only responsible for our behaviour in the present, but are responsible for the behaviour of our predecessors in the past as well. Typical of Folkert de Jong’s work is his use of coloured styrofoam and polyurethane foam. These materials are not intended to last for eternity and are not environmentally friendly whatsoever. It is this disturbing property that intrigues the artist. 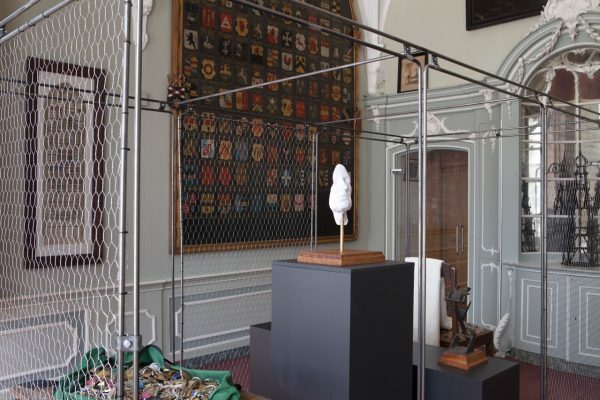 In his sculptures he often refers to dark events in the past, which he then relates to contemporary events with an ironic twist, connecting the history of art with the present day. The new work that Job Koelewijn (NL, 1962) has created especially for the exhibition consists of an installation of vases with colourful, fragrant flowers. 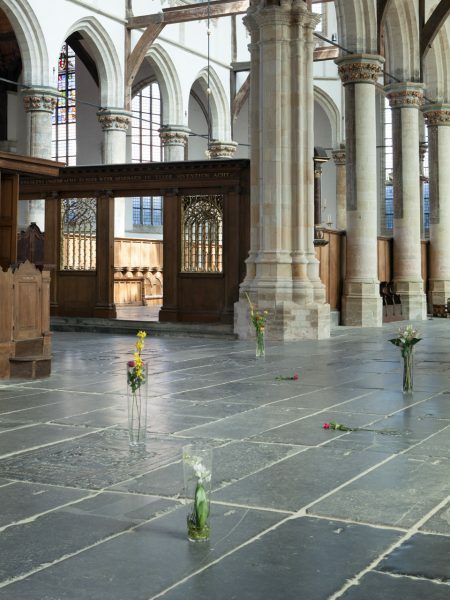 The vases are placed carefully on the church’s tombstone floor, in memory of the dead who were buried here many centuries ago. Flowers are used at many moments in life as an expression of joy, but they are also used at moments that are coupled with sorrow, as an expression of love and solace for the bereaved. In the church the flower arrangements leave a solemn, serene and at the same time slightly absurd impression. Who are we commemorating here and for whom do the flowers provide solace? Job Koelewijn’s work is often conceptual in character, but is at the same time strongly sensual and always alludes to reality. The subjects of ‘time’ and ‘timelessness’ play an important part in his work, which ranges from photos and films to small objects and space-filling installations. 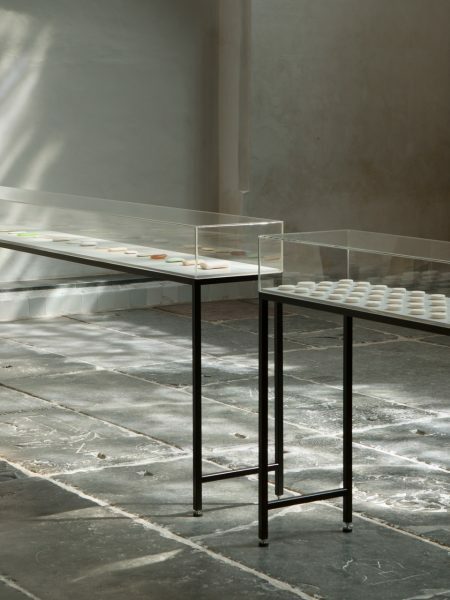 Koelewijn often uses materials that appeal to our sense of touch and smell, that possess a great fragility and ‘purity’. *The realization of this artwork is made possible by the help of Bloemenwinkel Jemi Amsterdam. The painting Untitled (Lives were changed …) by the artist duo Muntean/Rosenblum (AT/IS, 1962) portrays a group of youngsters dancing ecstatically. They seem to have just stepped out of a modern lifestyle magazine. At the same time the subjects’ poses are reminiscent of classic poses from Christian iconography. ‘We try to distil a sense of spirituality from the superficial, alienating spectacle of consumer culture, in which everything is about ‘adapted behaviour’, about everyone doing and liking the same,’ according to the artists. 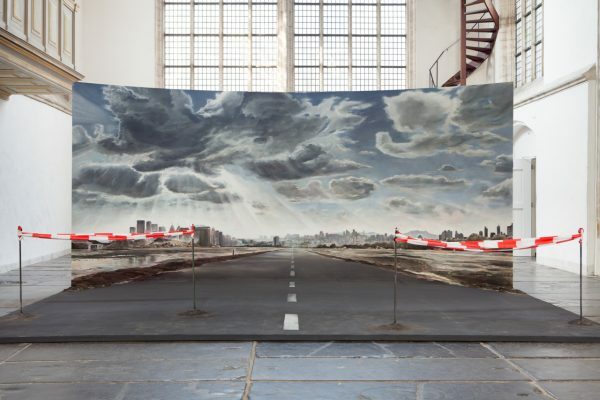 The new work that Muntean/Rosenblum created especially for the exhibition consists of a panoramic painting of a blanket of clouds opening up above a desolate motorway, just outside the city. During the opening there was a performance with five singers who performed a sacred motet, a work for voices alone, by the Renaissance composer Cristóbal de Morales (c. 1500–1553). In line with Muntean/Rosenblum’s desire to create ambiguous images – images full of pathos (the Greek word for suffering or emotion) – this new work also tests the public’s emotions and raises questions about our existence. Whence do we draw hope? How do we give meaning to our lives in the light of our mortality? Two-channel full HD video projection, 10 min loop. The video work The Lightworkers by Yehudit Sasportas (IS, 1969) shows us an ominous landscape, composed of more than 150 drawings, full of strange, dreamy elements. The trees and swamps are dark and light, delicate and heavy, lyrical and gruesome, dead and living – all in the same instant. The searching light of a torch shines amid the trees, where superimposed vertical lines and black bars, which are reminiscent of barcodes or scanners, topple over one by one. The video installation immerses the beholder in a psychological space that appeals strongly to feelings of loss and unconscious fears. In recent years Yehudit Sasportas has built up an intrinsically multi-layered and complex oeuvre of drawings, paintings, videos and installations. The relationship between the conscious and the subconscious is an important theme in her work. She is interested in creating a ‘topography of the human psyche’, an existential investigation of the ‘wounds, hidden feelings, and memories that surface from time to time’. 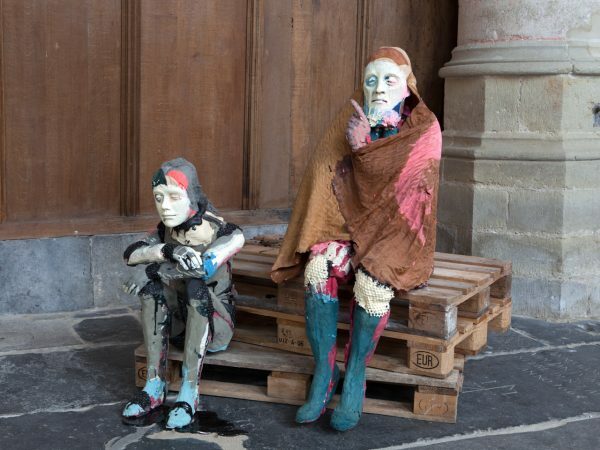 Once in a Lifetime is curated by Nina Folkersma and the result of collaboration between Oude Kerk and the Humanistisch Verbond (the Dutch Humanist Association). The exhibition is made possible by Amsterdam Funds for the Arts AFK , the Sluyterman van Loo Fund, the KunstenIsraël foundation, the Embassy of Israel in the Netherlands, the Mondriaan Fund and the Prins Bernhard Culture Fund. With special thanks to Finbar van Wijk. Photo: Folkert de Jong, Heritage (2009) at Oude Kerk, 2016 © Robert Glas. The Oude Kerk is a registered museum. Permanent partners are the Amsterdams Fonds voor de Kunst en de vrienden van de Oude Kerk. The monument is maintained and restored with the support of the Rijksdienst voor Cultureel Erfgoed.